Sports play an important part in the development of an individual and society. Sports is a physical activity which inculcates discipline, activeness, fitness, and team spirit among people. Playing sports is a common physical activity taken up by health-conscious individuals globally. Not only professional athletes, but children as well as adults play sports. The physical activity involved while playing sports may lead to injuries among the players. Sports medicine is a branch of healthcare that deals with the prevention and treatment of sports injuries and the overall physical fitness of active sportspersons, affecting their functioning and performances, hence, sports medicine is specifically important for them. The treatment of injuries may involve the use of medical devices and pharmaceuticals. These medical devices include implants, arthroscopy devices, suture anchors, braces and support and many other accessories. With the rising awareness about sports and fitness, there has been an increased participation in sports even by the non-professional sportsperson and hence there is an increase in the need for the development of novel diagnostics, prevention techniques and treatment methods which are aimed specifically at sports injuries. The market has witnessed significant advancements in the past few years through the intervention of high-end technologies and medical devices. These advanced treatment methods have reduced time for the recovery. The BIS Research report on global sports medicine market includes an in-depth examination of the key ecosystem players, key strategies, and developments taking place in global sports medicine market. Additionally, the report includes an analysis of market dynamics (market drivers, opportunities, and challenges) and industry analysis. The market has been classified based on different application, such as knee, shoulder, foot and ankle, elbow and wrist, hip, and others. Region-wise, the market can be segmented into five distinct regions that include North America, Europe, Asia-Pacific, Latin America, and Rest-of-the-World. The purpose of the study is to gain a holistic view of the global sports medicine market in terms of various factors influencing it, such as key market trends, competitive and regulatory aspects of the market, and scientific innovations in sports medicine. The scope of the report is centred upon conducting a detailed study of the solutions allied with sports medicine market, which involves techniques used in different applications of sports injuries. The global sports medicine market is segmented into three different parts: ‘by products’, ‘by application’, and ‘by region’. The report offers the reader an opportunity to unlock comprehensive insights with respect to the market and helps in forming well-informed strategic decisions. The research uncovers some of the substantial parameters that must be taken by the industry players into consideration before entering the market. • What is sports medicine? What are the products included in sports medicine? • What are the major market drivers, restraints, and opportunities in the global sports medicine market? • What were the market shares of the leading segments, and sub-segments of the global sports medicine market in 2018 and what will be its share in 2026? • How will each segment of the global sports medicine market grow during the forecast period from 2019 to 2026, and what will be the revenue generated by each of the segments by the end of 2026? • What are the major regulatory authorities/ associations/ consortiums affecting the sports medicine market? • Which product segment is expected to register the highest CAGR for the global sports medicine market? • How has the market been segmented based on application? Which application segment had the largest share, and the fastest growth rate in the global sports medicine market? • Which region will contribute to the highest sales of the sports medicine during the forecast period and which will have the highest CAGR? 8.10 Mueller Sports Medicine, Inc.
Sports play an important part in the development of an individual and the society. Sports is a physical activity which inculcates discipline, activeness, fitness, and team spirit among people. Playing sports is a common physical activity taken up by health-conscious individuals globally. Not only professional athletes, but children as well as adults play sports. However, participation in sports may also lead to physical injuries, requiring the right practices for prevention and the right treatment for faster recovery. Several products, as well as invasive and non-invasive procedure and advanced techniques, are used for prevention and treatment of these injuries. Sports medicine, a significant part of the healthcare sector, provides treatment and recovery for several injuries that occur during sports, exercises or any other physical activities. The healthcare professionals associated with sports medicine are specialized professionals with expertise on treating, and preventing, sports injuries, to help the injured athletes heal and recover faster. The global sports medicine market was estimated to be $5.99 billion in 2018 and is expected to be $9.25 billion by 2026. It is expected to grow at a CAGR of 5.64% from 2019 to 2026. Nowadays there is an increased participation by people in different sports as people are more concerned towards their health. School curriculums, world-wide also emphasize on sports being a part of the education system of and encourage students in different sports activities. Prevention and recovery from injuries endured during sports activities are crucial for the performance of a professional, as well as nonprofessional, sportsperson. With the rising participation in sports activities and awareness towards health, there is an increased requirement of novel diagnostics, prevention techniques, and treatment methods specifically for sports injuries. The global sports medicine market has therefore, witnessed significant advancements in terms of product launches in the past few years through the intervention of high-end technologies and medical devices. 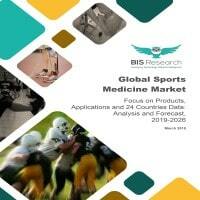 The purpose of the BIS Research study, Global Sports Medicine Market: Analysis and Forecast, 2019-2026, is to gain a holistic view of the global sports medicine market against various factors influencing the market, such as the key market trends, competitive and regulatory aspects of the market, and technical advancement in the field. The scope of the report is centred upon a detailed study of the solutions allied with sports medicine market which involves medical device used in different treatments and applications for sports injuries treatments. The global sports medicine market is segmented into three different parts: ‘by products’, ‘by application’, and ‘by region’. The global market value for sports medicine was estimated using these three different approaches and was validated against one another. Based on products, the market can be sub-segmented into body reconstruction and repair, body support, and accessories market respectively. The market for body reconstruction and repair dominates the market in terms of revenue. The growth of the body reconstruction and repair market is accredited to the efficiency of these for advanced methods of treatment for different injuries. However, these type of repair and reconstruction devices are mostly preferred for correcting any type of injury. Further, the fastest growing segment was estimated to be body support products which include braces and support systems for knees, shoulder, elbow and other types of joints. These products are used to restrict movement, reduce pain and inflammation, and provide support to the joint injury. The sports medicine market has a promising potential for growth in the coming years. The report provides an in-depth SWOT analysis of different key players of the market, supported by an extensive financial summary of each company. The key players of the market are Smith & Nephew, Stryker Corporation, DePuy Synthes, RTI Surgical, Osiris Therapeutics, Arthrex Inc., Bioventus LLC, Breg Inc., Ceterix Orthopedics Inc., CONMED Corporation, DJO LLC, General Electric Company, Johnson & Johnson, Mueller Sports Medicine, Inc., RTI Surgical, INC., Wright Medical Group N.V., and Zimmer Biomet Holdings, Inc., among others.